And when Oregon State University hired her to organize the campus food bank, Clare Cady was unemployed, homeless and living in her car. "Increasingly we're seeing students that are older, we're seeing students who have children or a dependent parent," says Cady, co-founder of the College and University Food Bank Alliance, a consortium of 641 campus-based programs focused on alleviating food insecurity, hunger, and poverty. Research from Oregon State University showed that recent college graduates consider culture when evaluating an employer and don't necessarily see alcohol as a desirable perk. A piece by OSU's Ron Mize. Oregon State University-Cascades’ construction funding adventures over the past two sessions of the Oregon Legislature had a happy ending. Winter is here, but there are always gardening questions. Get answers from Ask an Expert, an online question-and-answer tool from Oregon State University’s Extension Service. Southern Oregon is being hit hard by warming temperatures that worsen wildfire risk and reduce snowpack, but local agriculture could benefit from longer growing seasons, according to a new climate change report. The Oregon Climate Change Research Institute at Oregon State University released its 2019 climate assessment Friday. The Legislature has mandated the periodic reports. Engineering graduate students at Oregon State University will share their research projects at OSU's annual Graduate Research Showcase, from 1:30 to 4:30 p.m. on Friday, Feb. 8. Not all of the chemicals from these products can be fully removed in water treatment facilities—and this low-level exposure to chemicals with warming water temperatures showed to influence gene expression in the offspring of North American fish, according to a new study from Oregon State University. The club has scored well in recent years in Department of Energy CyberForce competitions, placing third nationally after winning the regional competition for the second consecutive year. 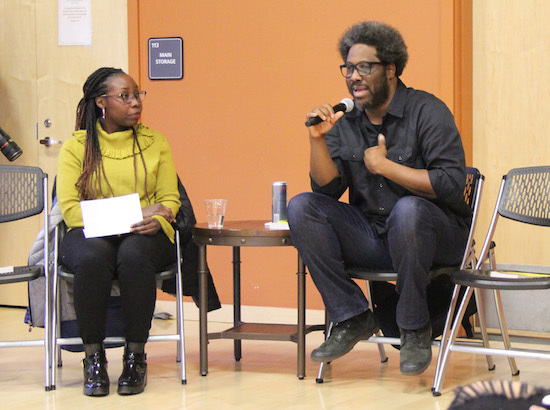 Bell curve: Comedian, author and host of the CNN show "United Shades of America," W. Kamau Bell visited with students and faculty on Thursday, Jan. 31, at Oregon State in addition to giving a sold-out talk at The LaSells Stewart Center. Rummage Sale EESC will host a rummage sale in the fourth-floor foyer of Kerr from 8 a.m. to 5 p.m. Feb. 4-8 to support the annual food drive. Peruse housewares, books, movies, toys, clothing, and more. For questions, contact Noelle.Mills@oregonstate.edu. NEW! PB&J Bar - Choose from a variety of jelly, jam, butters and honey to make your PB&J. Feb 4-8 stop by Gilmore Hall 116 from 8 a.m. to 5 p.m. to make your sandwich. Thanks to New Morning Bakery for their generous donation. Suggested donation of $1-5 based on what you can afford. FMI email jennifer.cohen@oregonstate.edu. Duo Town Hall: A town hall will be held in the Horizon Room at the Memorial Union on Monday, Feb 4 from 9:30 to 11 a.m. There will be a short presentation about why mandatory Duo is happening, how it will impact you, how to get a token, and other project information, followed by time to get your questions answered as well as sign up for Duo on the spot. This session will also be available on Webex. See https://is.oregonstate.edu/duo/events for more information and to indicate your interest. Send any questions beforehand to duo.support@oregonstate.edu. Beverages will be available. Bake Sale: Prices vary depending on the baked goods. Feb. 4, 10 a.m. to 3 p.m., Richardson Hall, 2nd Floor Knuckle. For more information, contact Jessica.Fitzmorris@oregonstate.edu. Department of Integrative Biology Ph.D. Defense Seminar: Ian Morelan will present "16S rRNA Gene Amplicon Sequencing Reveals Marine Bacterial Diversity in Natural and Human-Built Systems" on Monday, Feb. 4, at 12:30 p.m. in LPSC 402. Morelan is completing his Ph.D. in molecular and cellular biology under the guidance of Dee Denver. Free and open to the public. 2019 Harward Lecture: Randy Dahlgren, professor of soil science at the University of California, Davis, will give the 2019 Harward Lecture on “Biogeochemistry in California Oak Woodland-Annual Grassland Rangeland.” He will speak Feb. 4 at 4 p.m. in the Agricultural and Life Sciences Building 4000 as part of the Crop and Soil Science/Horticulture Winter Seminar Series. For more information, contact Emmalie Goodwin at Emmalie.Goodwin@oregonstate.edu. INTO OSU forum: Provost Ed Feser and a panel of INTO OSU board members and leaders will discuss the INTO OSU partnership and answer questions. Feb. 4, 5:30 p.m., ILLC 155. Open to all OSU students, staff and faculty, as well as the Corvallis community. This forum will not be streamed or recorded. Email Gigi Bruce if you are not able to attend the forum, but have a question or comment to share. Eating Animals: A film screening and discussion, based on the best-selling book by Jonathan Safran Foer, Eating Animals- a look at the environmental, economic, and public health consequences of factory farming. Tracing the history of food production in the U.S., the film charts how farming has gone from local and sustainable to a corporate "Frankenstein monster" that offers cheap eggs, meat, and dairy at a steep cost: the exploitation of animals; the risky use of antibiotics and hormones; and the pollution of air, soil, and water. Wednesday, Feb. 6, 6 p.m. MU Lounge. Free vegan pizza. NEW! 2019 Learning Innovation Grant Showcase: The OSU community is invited to attend this interactive event with poster and digitally-enhanced “poster” sessions on Wednesday, Feb. 13, 11 a.m.- 1 p.m. in the MU Horizon Room. Join us to celebrate the creative projects of LIG awardees who are enriching student learning and experience. Learn more here. Questions? Email robin.pappas@oregonstate.edu. NEW! The Defamation Experience: A courtroom drama that explores issues of race, class, religion, gender and the law with a twist: the audience is the jury. This is a unique opportunity to engage in civil discourse about pressing social issues. Feb. 13 at 6 p.m. in LaSells Stewart Center. Free and open to the public, though registration is required. The fourth annual Human Library: Event participants will engage in 45-minute two-way conversations with individuals who volunteer as “Human Books.” Experiencing a discussion with a human book creates an opportunity for constructive dialogue, learning and empathy between two people who otherwise might not interact. A list of books and registration for “readers” are available at https://guides.library.oregonstate.edu/humanlibrary. The event will be held on Wednesday, Feb. 13, 10 a.m. to 3 p.m. in the Valley Library, fourth floor rotunda. Preregistration is encouraged. Direct accommodation requests related to disability or general questions to Shalece Rains at 541-737-4537 or shalece.rains@oregonstate.edu. This event is sponsored by OSU Libraries and Press and the University Ombuds Office. Decades Dance: Missing the good old days? Come to the Decades Dance - best of the '60s,'70s, '80s, '90s and beyond. Dress up in your favorite outfit from your favorite decade for this Faculty Staff Fitness fundraiser that takes you back to the hits of each decade. The event will be March 2, 7-10 p.m., in the Women's Building Gym. There will be a cash bar. Early registration online $15, at the door $20. Invite your friend, meet new people and support Faculty Staff Fitness. For more information and to register visit: https://health.oregonstate.edu/faculty-staff-fitness/events/decades-dance. NEW! WRGP Water Resources Engineering Winter Seminar Series: Piotr Cienciala, University of Illinois at Urbana Champaign, Geography & GIS will present “A Tale of Rivers, Forest & Fish Revisited: Some New Insights at the Interface of Geomorphology & Ecology” on Wednesday, Feb. 6, from noon to 1 p.m. in STAG 111. Free and open to the public. NEW! Faculty Grant Training: The OSU Foundation is presenting a faculty training, “Creating Impact & Broader Impact,” at the new OSU Foundation Office, 4238 S.W. Research Way on Friday, Feb. 8 from 2-3:30 p.m. Join us as we discuss the why and how or articulating the societal contributions of your work within a proposal. Contact Elizabeth Ocampo at Elizabeth.Ocampo@osufoundation.org to attend. ElderCare Connections: Corvallis Senior Center: Join us on Tuesday, Feb. 5, from noon to 1 p.m. in MU 207 to learn about classes and offerings provided by Chintimini Senior & Community Center. To see upcoming topics, visit https://familyresources.oregonstate.edu/eldercare-connections or contact familyresources@oregonstate.edu. Chat with the Benton County District Attorney: Join members of the OSU NAACP Collegiate Chapter on Tuesday, Feb. 5, from 6 to 7:30 p.m. at the Native American Longhouse Eena Haws for a chat with Benton County District Attorney John Haroldson, Oregon’s first elected Latino district attorney. This will be an informal opportunity for students to connect with and ask questions of our district attorney. Light refreshments will be provided. Should you have questions or need accommodation email Curtis Gaspard at gaspardc@oregonstate.edu. Winter Community Dialogue: Coming to the United States of America: Who should we welcome, what should we do?Faculty, staff, and students are invited to explore multiple perspectives on strategies to uphold civil rights and address immigration justice. Open to the entire OSU and Corvallis community. Wednesday Feb. 6, 6-8 p.m, MU Horizon Room. Review the dialogue options summary and participant dialogue guide to familiarize yourself with the dialogue content. Join the Coming to the United States of America Community Dialogue Facebook Event. Learn more about the Community Dialogues initiative. NEW! Grilled Cheese Lunch: The AMBC is firing up the grill for customized grilled cheese sandwiches Tuesday, Feb. 5, from noon to 1 p.m in Hovland 09. Cost is $5 for the lunch, which also includes a bowl of tomato soup, chips, a cookie, and a drink. Questions? Contact April Cummings at april.cummings@oregonstate.edu. NEW! Soup Lunch: The soup will be $3 for one bowl or $5 for all you can eat. Feb. 6, noon - 1 p.m. in 240 Strand Agricultural Hall. For more information contact Jessica.Fitzmorris@oregonstate.edu. NEW! Hot Chocolate and Cider Break: Warm up during the month of February (4-28). Stop by Gilmore Hall 116 for $1 hot chocolate and cider every weekday from 8-5. For questions, contact jennifer.cohen@oregonstate.edu. NEW! Printing & Mailing Services' Annual Food Drive - drop off non-perishable food or cash to the Xpress Stop during the month of February: $1 or two cans of food to spin the wheel and every spin wins a prize. NEW! Gift Basket Raffle: EESC is raffling off four gift baskets. There will be a movie basket, Valentine's Day basket, book basket, and gardening basket. Drawings take place each Thursday. Tickets are 1/$1 or 6/$5. See Noelle Mills or Pete Petryszak in 422 Kerr Administration Building for tickets. For questions, contact Noelle.Mills@oregonstate.edu. NEW! BEE Girl Scout Cookie Raffle - Get your hands on 3 boxes of coveted Girl Scout Cookies, including the new Caramel Chocolate Chip. Stop by Gilmore Hall 116 to purchase your $1 tickets. Drawing on Feb 28. FMI email Jennifer.cohen@oregonstate.edu. NEW! Valentine's Day Card Sale: The AMBC will be selling one-of-a-kind handmade Valentine's Day cards in Hovland 108 from Feb. 1-14 to support the Linn-Benton Food Share. Cards are $2 each. Questions? Contact April Cummings at april.cummings@oregonstate.edu. Book and DVD Sale: Purchase lightly used books, DVDs and board games to support the 2019 OSU Food Drive. Items range $1-5 dollars. The sale will be running all month in the Magruder Hall lobby. For questions, contact Sara.k.smith@oregonstate.edu. Bingo! Bingo! Bingo! Get your bingo fix and help the local food bank. Business Affairs is hosting a virtual bingo game. Stop by Kerr B100 to get your bingo card; $1 each or six for $5. Cards will be sold through Feb. 15 with bingo numbers announced each weekday starting Feb. 18 on the BAFF Food Drive page. Winner receives 50 percent of the proceeds; the other 50 percent will be donated to the Food Drive. NEW! Scientists sought for NSF study: The Center for Research on Lifelong STEM Learning is looking for OSU scientists who would like to participate in a new NSF-funded research study about using audience feedback during outreach and public engagement activities and events. They are recruiting scientists (including graduate students, postdocs and extension specialists) who are conducting outreach and public science and engineering engagement activities to serve as “Design Testers” in the initial phase of our research. After a short training, Design Testers will test audience feedback strategies during their own outreach events over the course of about one year and provide feedback on their experience. There will be a moderate stipend of $400. The application can found here. Applications are due by Feb. 11. For questions, contact Kari O’Connell (PI and senior researcher) at Kari.oconnell@oregonstate.edu or Kelly Hoke (research analyst) at Kelly.hoke@oregonstate.edu. NEW! Research Equipment Reserve Fund (RERF). The Research Office is now accepting applications for the RERF. The budget this year is expected to be $400,000. Research Equipment Reserve Funds (RERF) may be used to acquire, repair, renovate, or improve equipment directly used for research. The equipment may be inventoried capital equipment (defined as =>$5,000 per unit), or fabricated capitalized equipment. Proposals are due by Friday, March 15, 5 p.m. Firm deadline. Questions: Contact Research Office Incentive Programs at: Incentive.Programs@oregonstate.edu. NEW! The latest issue of Oregon Sea Grant’s newsletter, Confluence, is now available: This issue includes stories about salt marshes outpacing a rising sea; assistance for tourism businesses on the Oregon coast; buying seafood at the docks; suspected microplastics in oysters; and internships that help Oregon companies reduce waste. Read the full issue here. Updates to University Policies & Standards: Visit the University Policy & Standards page (http://policy.oregonstate.edu/whats-new) to learn about recent and pending policy amendments, which includes University Policy 01-020 International Travel. The What’s New page is updated frequently with new developments so we encourage you to check back regularly. The University Health & Safety Committee: The University Health & Safety Committee wants to promote health and safety with information from SAIF on Safety Hazard Recognition, available online at https://www.saif.com/Documents/SafetyandHealth/HazardID/S927_effective_hazard_recognition.pdf. Did you know that you can also access OSU’s University Health & Safety Committee online at http://ehs.oregonstate.edu/uhsc, including past meeting minutes, information on how to contact a committee member, and a link to report safety concerns online. Construction commencing in library, and there will be noise during winter and spring terms: Remodeling will be under way through May on the third and fourth floors of the Valley Library during the remodeling of library offices, and there will be construction noise, especially early and mid-morning. For those seeking a quiet area in the library, the fifth-floor rotunda is designated as a quiet area and the entire sixth floor is for silent study. Carbon emission reduction: To support OSU’s carbon emissions reduction goals, ASOSU, the Sustainability Office and the OSU Foundation have launched the university’s first fundraising effort focused on reducing university carbon emissions. A small project at Kelley Engineering Center would save around 2,000 pounds of carbon annually and support student engagement and research. A large number of donors is best so small contributions are welcome on the Foundation’s crowdfunding platform. Request for Proposals: The OSU Advantage Accelerator is seeking proposals to facilitate the further development and commercialization of OSU applied innovations. Proposals can be submitted for OSU-owned innovations developed by OSU faculty, staff, and/or graduate students in any discipline that require up to $25,000. Proposals are due no later than 5 p.m., March 1. Read the full RFP here: https://advantage.oregonstate.edu/advantage-accelerator. New Major: Bachelor of Science in Public Policy: Are you an undergraduate looking to create meaningful change through public policy and law? The new Bachelor of Science in Public Policy teaches you how to effectively identify, investigate and propose policy solutions for the complex issues challenging communities today. Applications for the major are being accepted, so explore our website, meet with our adviser, and apply early. Be a presenter at the Ecampus Faculty Forum: Contribute to Oregon State’s excellence in online teaching and learning by sharing your expertise at this spring’s Ecampus Faculty Forum. Submit your proposal for a presentation by Feb. 10. Interactive sessions are encouraged but conference-style presentations are also welcome. The faculty forum will be held May 1 at the CH2M HILL Alumni Center. Social Justice education: The Social Justice Education Initiative from Faculty Affairs is a foundational professional development program for all faculty, staff and graduate students. SJEI offers a varied schedule of Tier One and Tier Two workshops, all open now for registration. Join your colleagues to begin, or expand, your equity and inclusion journey in this well-reviewed program. Interested in this work for your unit? Contact SJEI Director Jane Waite for further information: jane.waite@oregonstate.edu. Library Undergraduate Research Awards offer $1,000 scholarships: The deadline for applying has been extended to Feb. 18. Impressed by a student’s research paper or project? That student could win $1,000 for their work through the Library Undergraduate Research Awards, which offer one prize for a paper or project in the arts and humanities and another for work in social sciences, sciences or engineering. Encourage your worthy students to apply. More info is at http://library.oregonstate.edu/awards/undergrad-research. Provost’s Literary Prize: We are now accepting submission for the 31st annual Provost’s Literary Prize. Students are encouraged to submit their creative writing piece to Professor Keith Scribner in the School of Writing, Literature and Film (Moreland Hall 238). The literary work can be fiction, poetry, or creative nonfiction written for a general audience. The prize is open to currently enrolled undergraduate students at OSU. Submissions are due by Feb. 15 and must be the student's original work, typed, no longer than 14 double-spaced pages for prose or eight manuscript pages for poetry, and include the full name, year in school, current mailing address, phone number, and student ID number of the writer. For questions, contact keith.scribner@oregonstat.edu (541-737-1645). NEW! The Office of the Provost is seeking a Vice Provost for Student Affairs (Vice Provost). This is a full-time (1.0 FTE), 12-month, fixed-term professional faculty position. Reappointment is at the discretion of the provost and executive vice president. Posting # P02742UF. Open until filled. "I have learned over the years that when one's mind is made up, this diminishes fear; knowing what must be done does away with fear." ~ Rosa Parks, born Feb. 4, 1913. Corvallis: .Snow showers today, mainly before 10 a.m. High 39, low of 25. Slight chance of snow showers Tuesday. Central Oregon: Snow today, high of 29. low of 17. Chance of snow tomorrow. Newport: Rain and snow showers today, high of 41, low of 33. Slight chance of rain or snow tomorrow.